Cookware is an absolute necessity in every household. Good quality cookware, however, can be very expensive, and it is difficult to find the best quality set that will last you a long time, and which material is ideal for the cookware. When it comes to quality material, stainless steel stands out from the crowd. Forget non-stick. This is the real deal. It is durable, versatile and the safest material for cookware you shall find out there. The truth of the matter is, if you buy the best quality cookware, you shall have the best quality food in your kitchen. 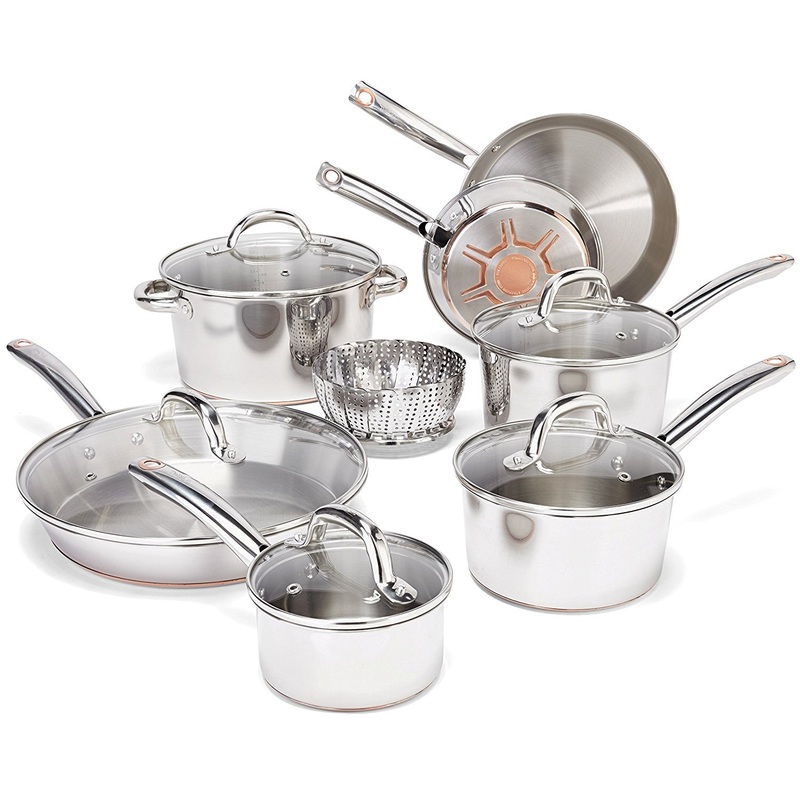 Having stainless-steel cookware in your house will be a real investment in your meals. The Cuisinart Multiclad Pro is not only a beautiful cookware set, but it’s also resilient and will stand the test of time. It has an aluminum core that is bonded on to a stainless steel exterior plus a mirror finishing of more stainless steel on the interior. Considering its sturdiness and durability, this cook-set is very reasonably priced. It has been created for a modern kitchen where quick cook time is essential. You can cook all the stages of the meal in this one pot. On the stove, in the oven, on a steamer, etc. Because of its polished surfaces, it does not alter the flavor of food, discolor or react negatively to food. It comes with cool grip handles that are secured with stainless steel rivets, tight-fitting lids, self-basting and triple-ply construction. It also includes an unsurpassed heat conductivity that is common with pure aluminum. Using these pots ensures maximum heat retention, even distribution of heat and the elimination of hot spots. It is also oven safe for up to 550 degrees, and its rims are tapered to facilitate a drip-free pouring. This is truly a great product to have in your home. 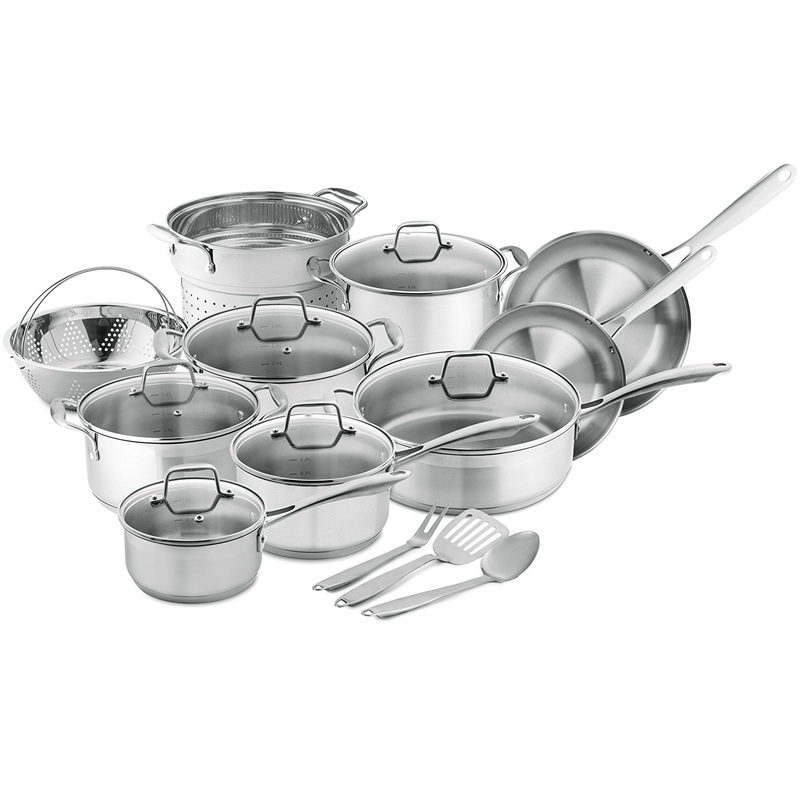 The set comes with 12 pieces of cookware, which consists of 3-quart covered saucepans, 3-1/2 quart sauté pans, 8 and 10-inch skillets and a steamer insert with lids. You can use them with induction cooktops. Because of the tight fitting rims and drip-free pouring, you are assured of great tasting meals every time as they seal in the moisture and nutrients for flavorful and healthy meals. They are very popular with professional chefs, and using them in your kitchen will turn your meals into hotel quality within no time. The superior heat surround technology, it provides a very quick response to any changes in temperature which create a perfect surface for cooking many different dishes and sumptuous meals. Cost: This cookware is very reasonably priced, considering the high quality. Heat control and distribution: The stainless steel material has the ability to control the heat while you cook and distributes it evenly to give the most delicious meals. Durability: It will last you a very long time, if well taken care of. 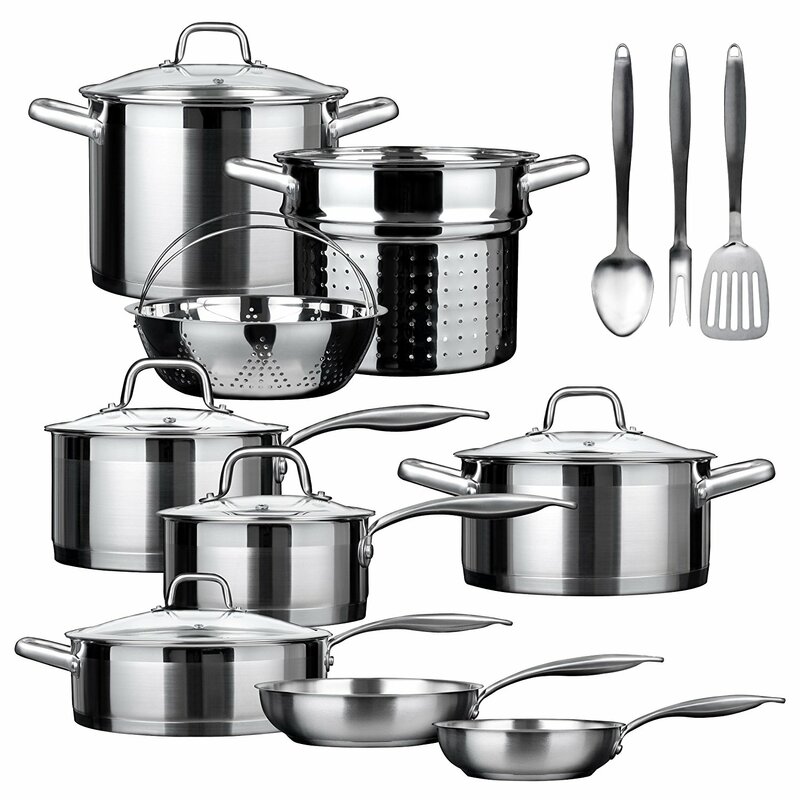 The set: This is a 12-piece cookware set that will equip you adequately in the kitchen. Design: It is very beautiful to enhance the look of every kitchen. They are very heavy, which is a good thing, but then they take a long time to heat up. Once heated, they can get very hot, so, be sure to use some oven mitts when handling them as they can easily burn. 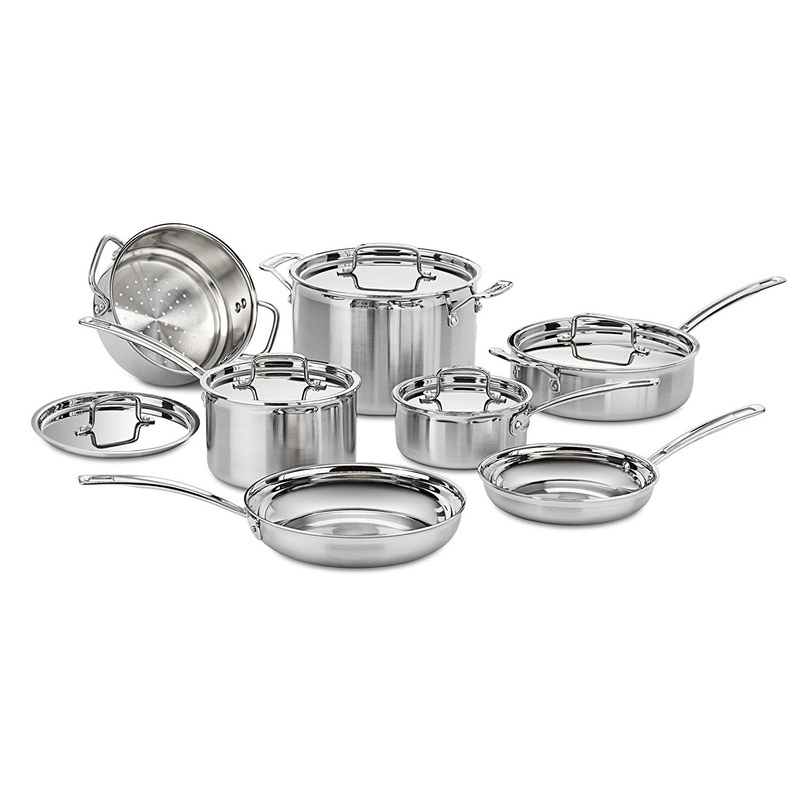 This is a very high-quality cookware set, that is sure to turn every kitchen into a professional space. When it comes to durability, it is very durable and will ensure you cook the most delicious meals for a long time. This cookware set is well respected in the industry and is a must-have for anyone who has ever desired class and quality together. Gauge refers to the thickness of the metal and is a clear indication of the quality of the cookware. The heavy gauge indicates that the pan is able to deliver heat without any warping with its usage. The beauty of it being multi-layered is that the pan will heat up evenly and quickly, without necessarily using up too much heat. As mentioned above, this is a very beautiful looking cookware that will reel you in with its glass lids. Nothing looks better than a cook-pot that allows you to see the food as it cooks. They also do not release all of the heat. Each pot has its own lid with a vented hole to let out excess steam. This will prevent vacuum formation and allow the lid to always come off whenever you want it to. It does not stick to the pot. They have riveted stainless steel handles that will provide you with a very secure and comfortable grip. They do not get hot while cooking and are very easy to clean. These handles are solid and sturdy, which adds a nice heft to the lids. These pots can be used in the oven for temperatures of up to 500 degrees. This means you can sear food on the stove and finish it off in the oven, or simply cook the whole meal in the oven if you want. The added advantage is that you can also keep the food warming in the oven after cooking. Since the handles are stainless steel, they are safe to use under the broiler. Ensure to use oven mitts while removing them as they get hot. Cleaning this set is very easy, as it is dishwasher friendly, but it can also be hand washed. Be careful while washing the pieces in the dishwasher as it tends to discolor them or give them some whitish spots. In case this happens, simply remove with some vinegar. You can use it on induction cooktops as well. The bottoms are multi-layered with 6 layers of aluminum, which makes the pieces very sturdy and strong. It is safe to use on induction cooktops. It is dishwasher friendly which makes it easy to clean and maintain. They pots are very beautiful with glass lids and can enhance the decor of your house. They heat up in the least time possible. Can be used in the oven easily. The pieces come with a sticker on the bottom that is hard to come off. The splash of copper at the bottom may flake and tarnish, so take good care of it. This is an affordable cookware set that is not only beautiful to look at but is also durable, easy to clean, and quick in heating. Also, the multi-layers of aluminum and copper makes it very sophisticated. For anyone looking to enhance their kitchen and make your meals much tastier, this is a good choice. The Chef’s Star is a 17 piece cookware set that is made of commercial grade stainless steel which makes it a very long lasting and durable kitchen appliance. The handles are ergonomically designed and shaped for comfort of use. The handles are riveted towards the pot, with an anti-slip satin finish. This provides maximum safety while you use them. The pieces are oven safe, dishwasher safe and even freezer safe. What this means is that you can cook your food comfortably in the oven at high temperatures, clean them up by putting in the dishwasher with some simple cleaning detergent and when you need to store up leftovers, no need to transfer to a plastic container. They will store very well in the freezer. A casserole with its lid. A stock pot with lid. Induction: It is suitable for all cooking sources, stoves and cook pots. It can be used with gas, electric, infrared, glass, ceramics, induction stoves, etc. Safety: They are BPA free, and can be heated up to 500 degrees in the oven. It is easy to clean as it can be put in the dishwasher. It is very safe, especially with the handles which are also very comfortable. It is strong and durable and will last for a very long time. It has tapered rims that makes pouring very easy and cleaning as well. Some foods may stick so always be on the lookout. This is an extremely beautiful cookware set for anyone looking to style up and enhance their kitchen decor. With its great handle design, this is also one of the safest and most ergonomic cookware set in the market. If you are looking for a top-rated and high-quality cookware set made of stainless steel that is set for induction cooker and of a moderate price-range, then you should consider the Duxtop Secura SSIB cookware set. It is the perfect match for you. It offers a very nice blend of high-end design, the best material, stylish look, long-life and even cooking. 1 piece sauté pan with a lid. 3 pieces of kitchen utensils – a slotted turner, 2-prong fork and a spoon. The pots are capable of even heating which brings a perfect flavor to the food. They have the impact bonded technique where each pan has an aluminum layer spread evenly between two stainless steel plates. This aluminum layer is useful because it stores the heat at the bottom of the cookware and then distributes it evenly. The process prevents hot-spot creation at the base of the pan and ensures the food cooks evenly. Induction ability: You can use the cookware with any other type of burner, e.g., electric stove, gas range, traditional cookers, ceramic cook-tops etc. Sturdy, durable and heavy-duty: the core material is the marine grade stainless steel that has a high-end stain resisting ability, with great strength and superb durability. It is suitable for a semi-restaurant kitchen for daily cooking chores. The inner walls have measurement marks that allow you to measure food quantities accurately for an optimal flavorful taste. They have ergonomic handles which are comfortable and help you to lift the pots with ease. They are also riveted towards the cooking pots. They are induction cookware sets that can be used with any type of burners. They come with inner measuring marks for the right food measurements. They are ergonomically designed and very trendy. They are easy to clean as you can wash them in the dishwasher. The food may stick, so be on the lookout. This cookware set comes with a complete A-Z package of cooking pots. Their high-end and exotic blend of technology, as well as the high quality and durable materials used in its make keep it trendy, sturdy and strong. This is a great cookware set for any household. The Calphalon Classic cookware set is one that demands respect. This is a cookware set with looks that can kill but is also a great performer when it comes to cooking. It can brown and glaze in a very professional way. It is the choice cookware set for many people, as it never disappoints in any way. It has been designed in a way that makes it very beautiful and durable at the same time. It is made of a bonded aluminum base which can resist high impact, provides fast, even heating it is safe for stoves, broiler, dishwasher, and oven. The body is made of stainless steel, which makes it long-lasting and extremely resilient. It is also doubly secured and can resist scratching and corrosion. It has long ergonomic handles providing a very secure grip even while full and it also says cook when the pan is hot. This is very safe for any household and will protect the user from getting burned easily. The fill lines make it easy to measure food, and the covers have straining holes which line up with pour spouts for draining liquids without necessarily having to use any separate colanders. Any surface cooking: The cookware set can be used on any surface, gas, oven, broilers and induction cookers. Cleaning it is also very easy as the pieces are dishwasher friendly. 2 frying pans – 8 inches and 10 inches. 1 sauté pan with the lid. 6-qt sauce pot with lid. This is a really beautiful set of cookware that is guaranteed to enhance your kitchen decor. It is strong, sturdy and durable. The spouts make pouring very safe. The handles are ergonomically designed for easy grip and comfort. They have a 10-year warranty. They are suitable for any cooking top/surface. The handles may get hot at times, so be careful. They may scratch if stacked together. Do not use harsh detergents to clean them. Do not cook on high. Do not flip food while cooking. Allow the pot to heat up before adding oil. Soak the pots after cooking, and when possible soak them in soapy water. This is quite possibly the simplest form of comparison. Lift the stainless steel pot and gauge for yourself how it feels in your hands. You need to ask yourself whether it is well-balanced and if the weight is right for you. The knobs and lids should also fit perfectly, and the handles should be an easy grip and comfortable. The riveted handles and knobs are more secure and safe, so you should choose a pot that is of good weight, and easy to hold. The stainless steel itself is not a good conductor of heat, and in most cases, aluminum or copper are normally sandwiched between the stainless steel to make it better. The bottom layer which is in contact with the heat can also be made of copper or aluminum. Understanding this is very important when you are buying the cookware because this is what will guarantee you a quality product. 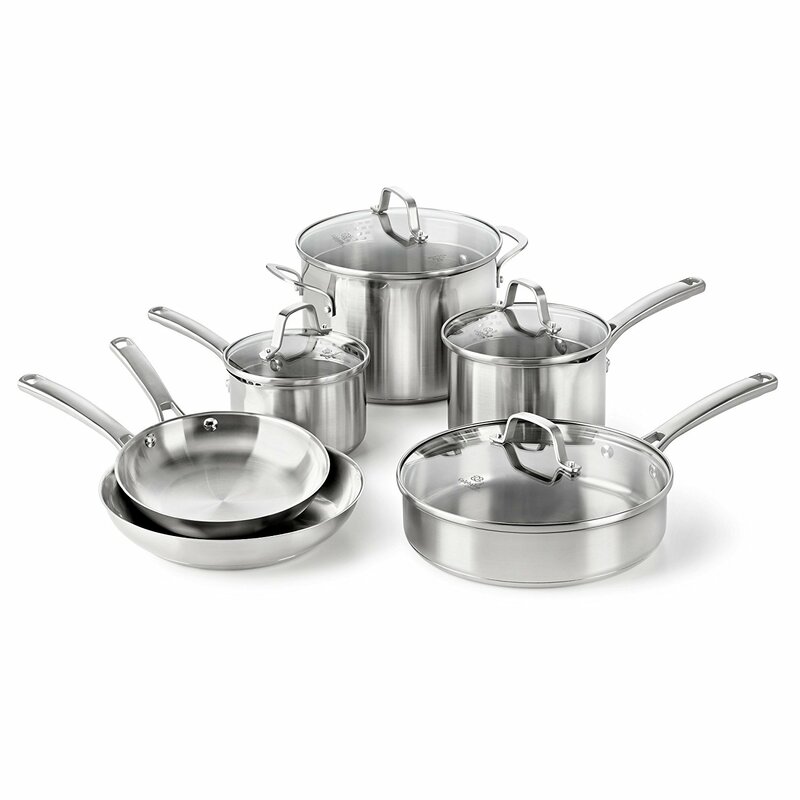 Remember a cookware set made only of stainless steel will not cook food efficiently. To check this, feel the weight of the pot. If it is too light, it doesn’t have any copper or aluminum, but a nice and heavy pot is well-made. Always ensure that the pot you buy comes with a warranty. Most manufacturers give a lifetime warranty, or anywhere from 10 years and above. You can also look for one that has a return policy, to be on the safe side. Now you want to make sure that the cook pot is made of 18/8 or 18/10 grade. These are the best quality standards for the stainless steel cookware. Check the bottom of the pot to find out which one has been stamped on it. These numbers represent the grade of the stainless steel. Specifically, the amount of chromium to nickel that has been blended into the stainless steel. E.g. if it shows 18/10, this means that the pot is made of 18% chromium and 10% nickel. This grade also identifies how corrosive the stainless steel is. The 18/10 grade or 18/8 is the 300 series of stainless steel with a high percentage of nickel. This series has a higher resistance to rust and corrosion. The 400 series has a stamp of 18/0 which means there’s less nickel, hence it has a high vulnerability to corrosion. They have enhanced heat transmission that makes sautéed foods the most delicious when cooked in such a pot. Their enhanced heat retention makes braised foods to turn out surprisingly well. They make searing and frying very easy. They are heavy and extremely durable. They can be used in the dishwasher, broiler and in the oven as well. They do not chip and can last you very many years. Why is it actually called stainless? It is called stainless because the stainless steel material is rust-proof. This means that it can never discolor, get rust or even look different in its lifetime, and hence the name stainless. It has a protective coating of chromium atoms which are bound with oxygen atoms to form a stable atomic layer. The oxygen content in the atoms causes it not to rust. Why should I choose stainless steel instead of wood or plastic? Well, you cannot cook with plastic or wood, but the reason why you should choose stainless steel is that it has a protective coating that is scratch and stain resistant and contains no cracks or pores that can harbor particles of bacteria. This protects you and your family from food-borne illnesses and makes it easy to clean after use. What are the numbers at the bottom of my pot? Why does my stainless steel pot have scratches after I clean it? They have scratches as you could be using very strong cleaning liquids or products. Try using softer products while cleaning it. Is the stainless steel pot dishwasher safe? Yes. Most of them can be cleaned in the dishwasher, however, if you mixed different grades together, it may cause rust spots to appear. Certain detergents can also cause the rust to appear, so, always use mild products. A good point to note also is that; if you put silver and stainless steel together in the dishwasher, it will cause the stainless steel to rust. What is the difference between stainless steel and galvanized steel? Galvanized has a zinc coating that will protect and seal the steel, while the stainless steel is made of a protective chromium layer made of oxygen. The galvanized steel is still rust resistant, but not long lasting. With time it will begin to rust. What does gauge mean in stainless steel? Gauge in stainless steel refers to the thickness of the material. It is represented numerically, and for stainless steel, as the gauge increases, the thickness decreases, which means that a 14 gauge table is thicker than a 16 gauge table. What does the no. 4, 6, 7 and 8 finishes of stainless steel mean? The no. 4 finish is very common. It is created by a 150 grit abrasive, and therefore it is brushed and not highly effective. It is commonly used in sinks as it does not wear out after too much use. It can withstand it. It also does not scratch easily. No. 6 creates a sort of ‘satin’ look, which is even textured, non-directional and has varying reflectiveness. No. 7 has a partial mirrored look, which is created by the buffing off the steel after taking it through the manufacturing process. However, the no.7 finish is not a real mirror finish. No. 8 is more like the no.7, but the buffing process is enhanced by more buffing compounds, which gives it a true mirror finish. What does NSF certification mean? Is it important? The product has been evaluated by NSF. The product has passed or exceeded all of the NSF standards. The NSF has permission to conduct periodically the audits of the product, plus its manufacturing facility, to ensure they continue to comply with all of their standards. Sinks that have been NSF certified means that they are designed and constructed in a sanitized way, and they are made of materials which are durable, non-toxic and corrosion resistant. It is also easy to tell which sinks are NSF certified because they have rounded corners, which prevents the build-up of debris and bacteria, plus their bottoms slope towards the drain to ensure the water does not stagnate. Do not cook on high use medium. To make them non-stick, use a hot pan and cool oil. 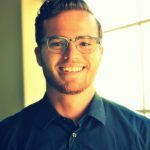 These points will help you use them for a long period of time. The Cuisinart MCP-12N Multiclad Pro is the most trusted in the market and comes highly recommended as its features are second to none.